← Pics of my trrrrrenday outfit 3.24. Wrapped up the fashion illustration drawing series today, and I think it is safe to say I’ve made vast improvements. I’ve always been able to sort-of draw, and I’ve always been good at not following directions. This combination is surprisingly worthless. Oh wait, you’re not surprised at all? But overall it was a great reminder that sometimes talent doesn’t mean being gifted- it can mean persevering and applying knowledge! And my fashion illustrations can be as fabulous as I want them to be, as long as I am patient and allow myself to keep seeking out growth! I’m finally seeing some of my artwork that I’m actually proud to show off!! This was what I presented to my classmates after only an hour of illustrating. Can’t wait to work on the final project and spend a lot more time on it. I’ll post within the week. Below is our lovely model! Oh-let’s name her! we’ll call herrrrrr…… Gisele! (pronounced GEE-suh-LUH. A name I thought sounded beautiful in my head in 7th grade German class, and I chose it to be my “class name” for the semester. Well I found out quickly it sounds more like a smelly migrating bird than a Victoria Secret model #middleschoolproblems…. moving on) Here is our faaaaabulous model Gisele and she is ready for fall. 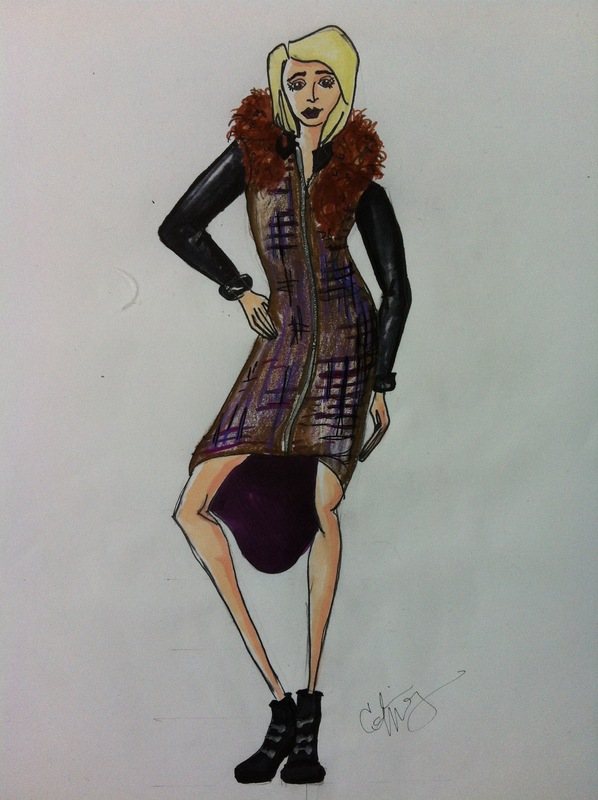 She is capturing the essence of rock-hipster-glam in this purple/camel plaid zipper dress complete with leather sleeves. Notice her dress is lined to keep her extra cozy along with that faux-fur scarf and heeled combat boots. A perfect outfit for grabbing a 16 oz soy pumpkin spice latte on the way to watch her boyfriend’s band play a fairly cool local venue. Rock on, Gisele. Rock on. This entry was posted in DCiL, fashion. Bookmark the permalink.